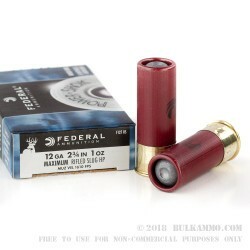 These 12 gauge shells from Federal's Power-Shok series deliver excellent performance against deer, extending the range of smoothbore shotguns far beyond the reach of buckshot. Power-Shok ammo is designed from the ground up to help hunters bag their quarry and do it cost effectively. Each 2-3/4" shell in this case of 250 fires one ounce (437.5 grain) rifled soft lead slug at a muzzle velocity of 1,610 feet per second. This high velocity promotes lethal expansion and energy transfer as well as a flat trajectory. 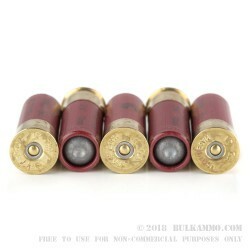 These shells are effective on deer-sized game at a range of 75 yards and beyond. Each case contains 50 boxes of 5 shells apiece. 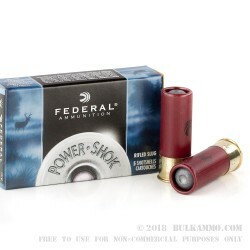 Federal Power-Shok ammunition is loaded in Anoka, Minnesota. Founded in 1922, Federal currently operates as a division of Vista Outdoor and employs about 1,500 people. Vista Outdoor is one of the largest groups of shooting related brands in the world and includes Speer, CCI, Blackhawk, Bushnell, and other notable companies. BEST SLUGS YOU CAN BUY!! !